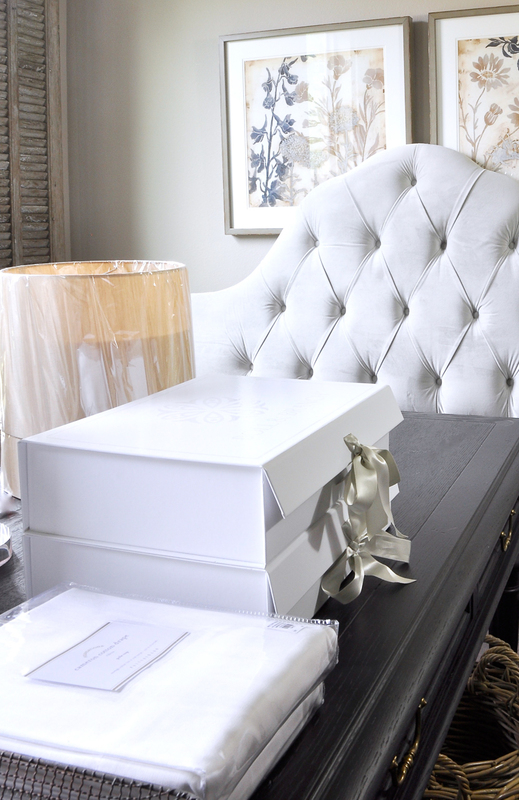 This week, my One Room Challenge was all about prep work, additional selections, and deliveries. The most exciting thing that happened…..the wallpaper arrived! If you follow me on Instagram, you may have seen the sneak peek I shared on my Instagram Story. The colors are absolutely gorgeous and I can hardly wait for it to be installed! I knew there would be setbacks. Actually, I take that back. I thought I was so organized that nothing could go wrong. 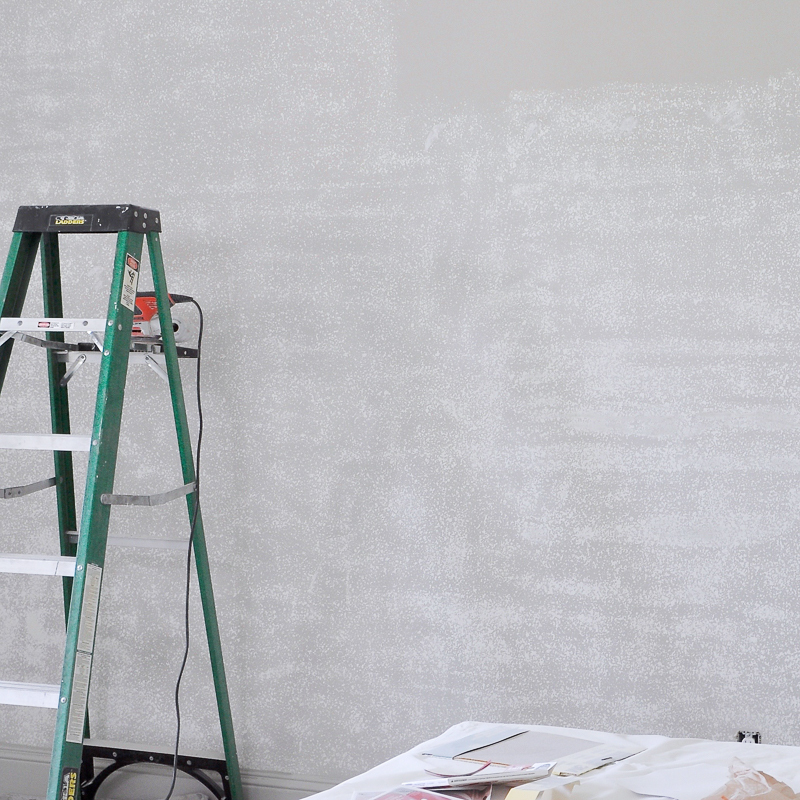 Then I realized the walls needed to be sanded before my wallpaper installer could start. Can we talk about the mess? Yes, that’s sanded off texture in the shot below. Thank goodness I have lots of drop cloths! However, the amount of dust in my house is far beyond what I anticipated. 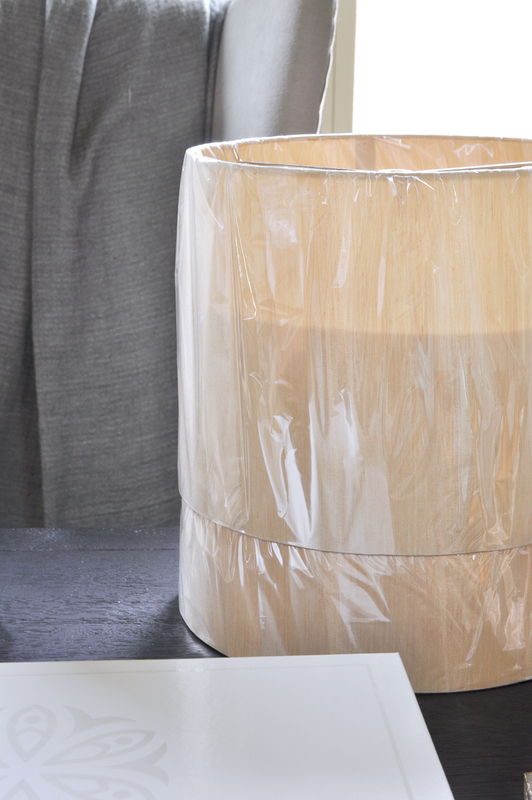 The other issue that arose, the lamp shades are the wrong color for this project. I love the lamps though, so I plan to keep them if I can find replacement shades. 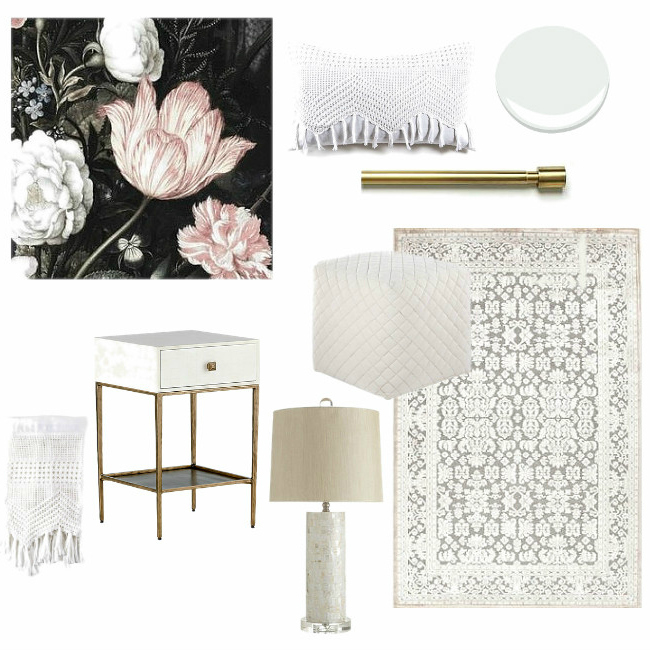 I selected a beautiful charcoal coverlet and some items from the vintage crochet collection by Pom Pom at Home. 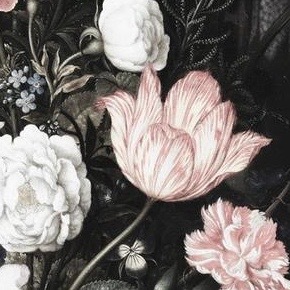 I think the coverlet will be beautiful with the charcoal background of the wallpaper. 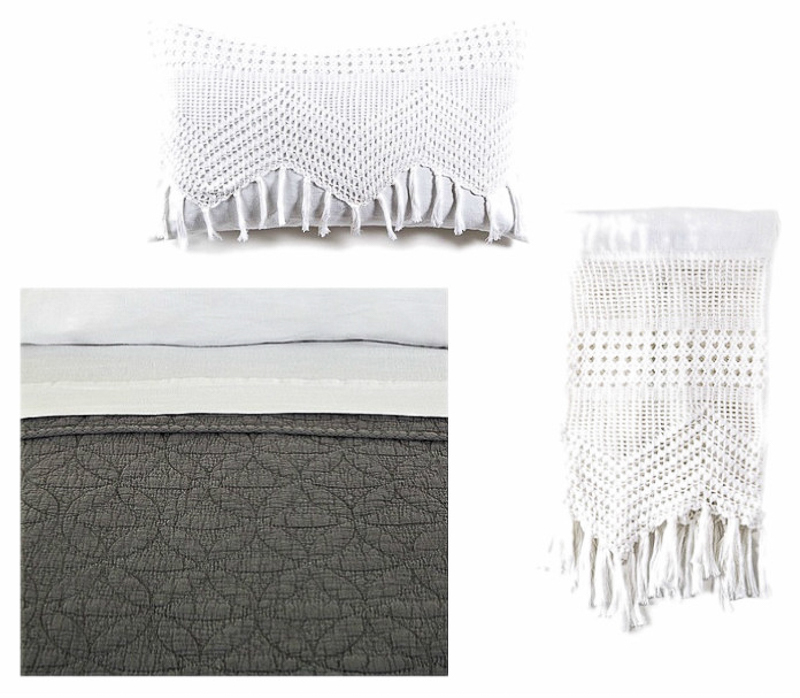 I already own many pieces by Pom Pom at Home and I knew their linens would fit perfectly into my design. 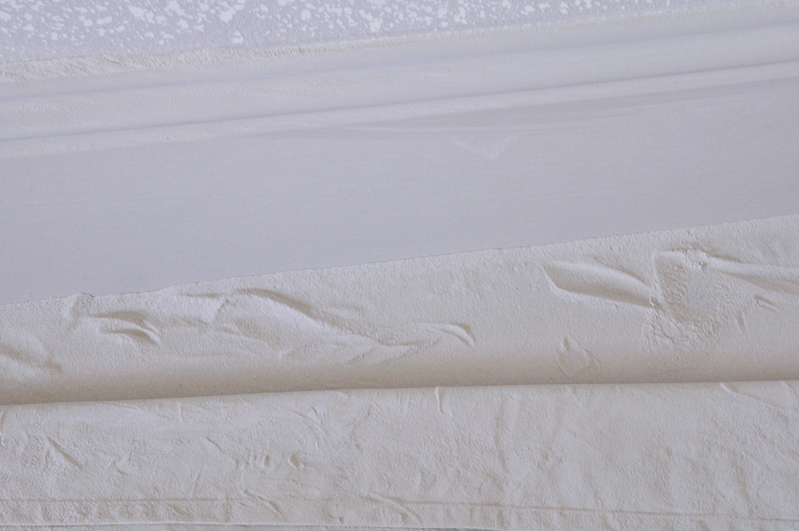 You can read about my love of linen and see some of my other pieces here. I also decided to go with white curtain panels. Thanks to those of you who helped me with this decision last week! 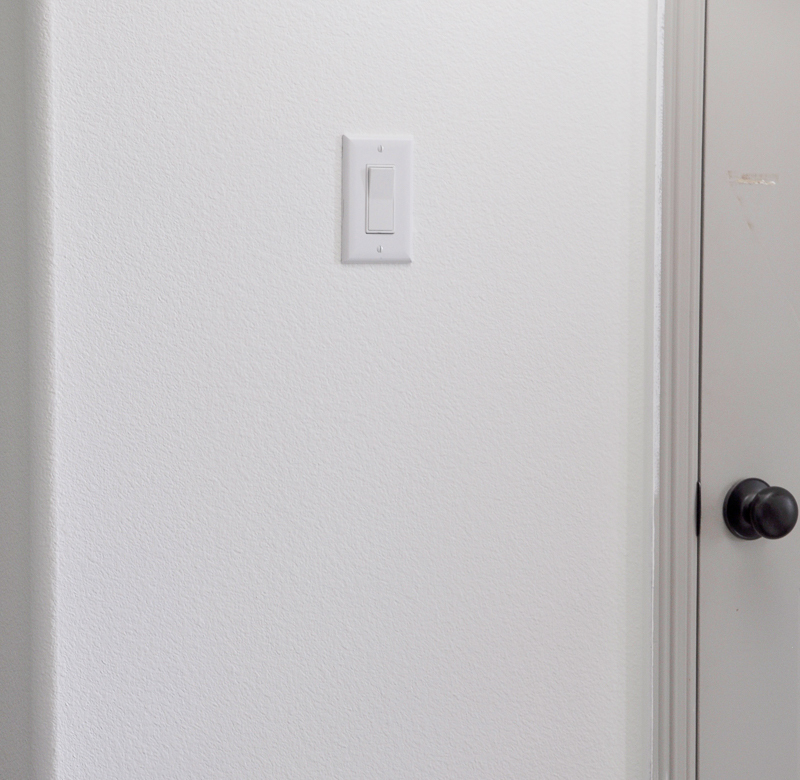 The ring of the doorbell and the sound of a delivery truck pulling away never gets old! Several more items arrived this week. Most are unpacked and taking over my office, but it’s okay because I enjoy looking at all of the beautiful new things. I ordered the curtain rod that I shared with you last week as well as the curtain rings. Additionally, the curtain panels arrived. Hopefully the rod and rings will arrive in time to be installed before my next update. Also, some new Boll & Branch sheets arrived. Since the guest room is still a construction zone, they are going to stay in their box for a little while longer. Isn’t the box beautiful? It was a bit dark today with storms in our area. I’ll try to get a better picture for you next week. I also finished painting the walls. I love how clean and fresh they make the room look! The trim moulding is next. Those are my One Room Challenge highlights! Thank you so much for following my progress. Please consider subscribing if you would like to receive my weekly newsletter. If you would like to see my design plans and last week’s progress, you can do so by visiting Week One and Week Two. Thank you! Today is officially dust cleaning day! Lol! Can’t wait to check out your bathroom progress! i am drooling over that wallpaper! Thank you Cassie…me too! I am excited to see it on the wall tomorrow! Looking GORGEOUS! Love the fringe accents! The mural is stunning! Wow, Jennifer that is a lot of sanding! I can’t wait to see that beautiful wallpaper up. It’s so gorgeous! I’m excited to see all the linens too. I love Pom Pom at Home!! Great job this past week! Thanks so much Yuni! I am still cleaning up the dust! 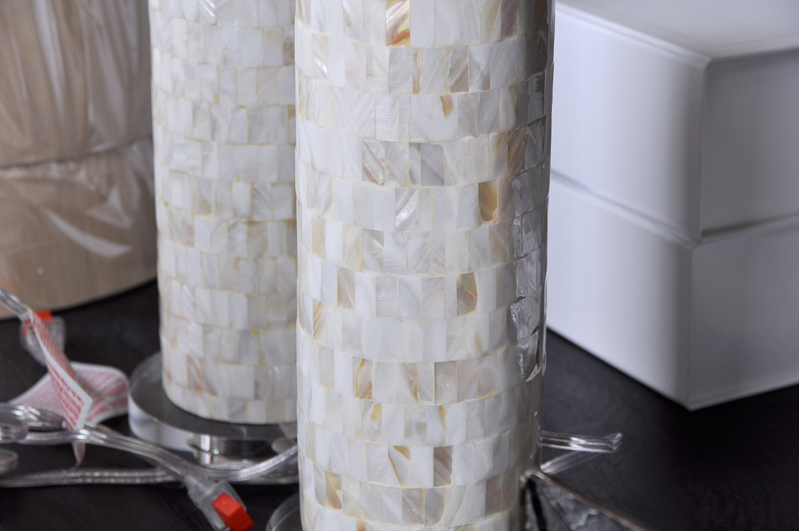 And yes, Pom Pom at Home has such beautiful pieces! I’ve loved them for a long time! Sanding is the worst part of any job! Lol It just always makes a mess. I love your lamps! They are so beautiful! I love when the deliveryman shows up with goodies, It is always a good day when that happens! Isn’t it? I bribed my son to help me sand and even with two of us it was a lot of work! Thanks so much for your kind words and for stopping by! Jennifer – this looks amazing! You got a lot accomplished this week! Can’t wait to see the final reveal! Thank you so much Jen! I am definitely feeling more and more excited! Jen I am in love with the way this is coming along! Seriously this guest room is stunning! Can’t wait to see that paper go up! Sorry it’s so dusty though!! Looking forward to next week! Thank you so much Tam! I think I got most of the dust cleaned up today. I’m literally sore from cleaning and painting! Oh my gosh. I’m both horrified and excited by all the sanding you did. It has never occurred to me that we could sand off the texture so I could wallpaper. So many possibilities now. But what a mess!!! I know all the mess and work will be worth it and you are going to have the most gorgeous office! Oh no, did I just create a monster? Lol! You can also float the walls with texture. It’s probably less messy. Love that bold wallpaper! And paint is always a powerhouse! Looking good! Thank you so much Charlotte! I’m starting to see the light at the end of the tunnel! Thank you so much!!! I’m dying to get the paper on the wall! All of your bedding and accessories are amazing! And seriously, I can’t wait to see that statement wall (I expect a DM sneak peek – ha!). Wow! I am in awe of your wallpaper! It’s Gorgeous! I also love your headboard! (LOL, Mine is exactly like it!) but I really have to hand it to you with all that sanding! You are a trooper…….I am excited to see it finished. It is looking so good! Love your bedding choices and that wall can’t happen soon enough!! Jen this is going to be absolutely beautiful! 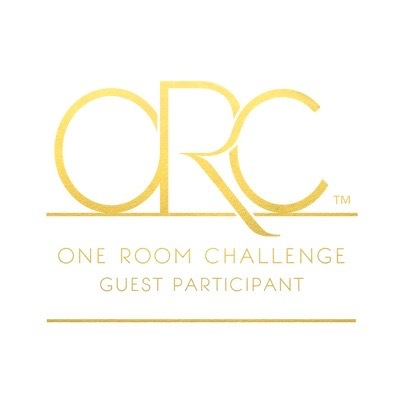 I am loving following along with this journey of your ORC challenge and I’m not going to lie….I am just absolutely giddy about the reveal of what the wallpaper is going to look like installed!!! Your office is so elegant and classy. I like how you put California and Texas on the wall. I can see why you wanted to keep the lamps. They are beautiful! Hope you find some other shades you like. 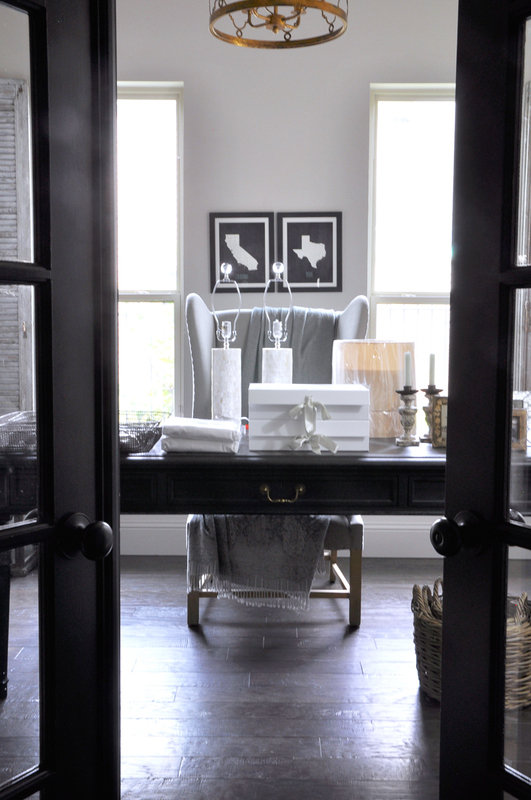 I’m sure your guest room will look wonderful after seeing a little of your office. That wallpaper is divine! 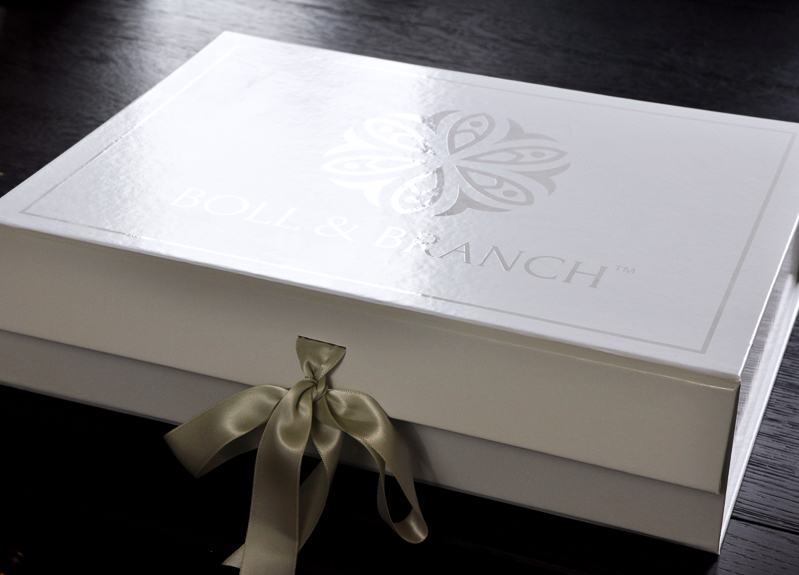 And I LOVE the packaging by Boll & Branch is to die for!!! Sanding that wall sounds like torture, but it will be so worth it in the end! All of your design choices are so gorgeous – and even their packaging is swoon worthy! I am so looking forward to seeing this room come together! Thank you Angela!!! I can hardly wait two more weeks! Thank you Kathryn! The dust is finally gone. Note to self: never again! Lol! Thanks for stopping by!